Guy: This week welcome to the show David O’ Brien. He is the fitness director of 5th Element Wellness. 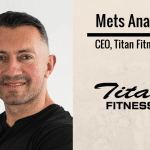 He has dedicated his life to individually tailoring wellness and fitness strategies to improve peoples lives. Having spent over a decade being educated by the world leaders in their respective fields, he has gone on to combine their knowledge to successfully develop his own strategies accumulated from his learning and honed through experience. Ultimately applying holistic solutions leaving people better informed, and feeling great. Adrenal fatigue is a hot topic at the moment. What is your take on it? You deal with blood chemistry markers within 5 th element. What are someof the trends you’re seeing? Examples? What type of message do you think is getting sent in the fitness industry at the moment? What type of training do you think is the missing ingredient in a lot of people’s lives? What are some of the common trends you are seeing in the people that you are dealing with that is having the most success? [00:00:30] [00:01:00] Hey everybody. Guy Lawrence of course from 180 Nutrition, and welcome to another fantastic episode of the Health Sessions, where we are connecting with leading global health and wellness experts to share the best and latest science and thinking, empowering people to turn their health and lives around. 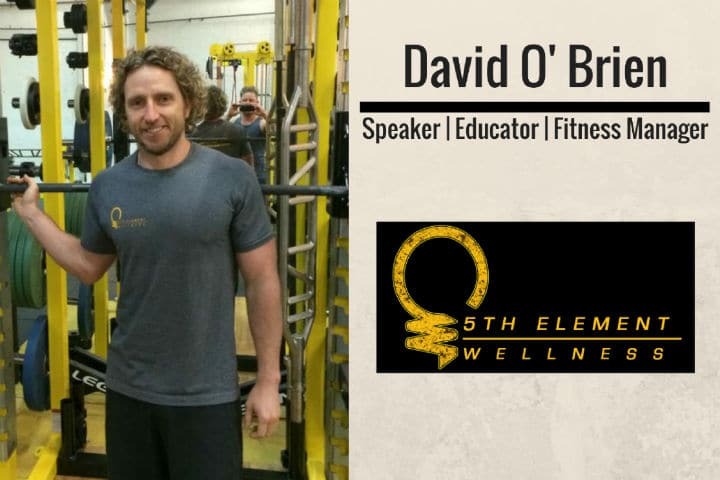 This week we have the awesome guest of Dave O’Brien, and he is the founder, I should say co-founder, of this amazing facility in Melbourne called Fifth Element Wellness. David has worked with some fantastic people including Ido Portal, Charles Poliquin, James LaValle, worked on blood markers and biochemistry, and also Louie Simmons, strength training, posterior chain and so forth. I’ve got to know Dave, he’s become a very good friend of mine and he is a wealth of knowledge and one of the first people I’ll pick up the phone to when I need to get the question answered, and to get him to share his wisdom on the podcast today was phenomenal. We tackle his own story from how he burnt out to chronic fatigue and adrenal fatigue massively, and the steps he started to take to reverse that around. Not only that, but the things that he sees on a regular basis through his Fifth Element Wellness, and the steps we can take to adjust accordingly moving forward, to create our most optimum wellness and health and the best versions of ourselves. [00:01:30] [00:02:00] Now this goes off in all sort of directions. We cover many many topics, like I said adrenal fatigue, the fitness industry in general, movement, where we should be starting from when it comes to exercise as well, and we get into hormonal function as well. You name it, it’s in there. Probably a podcast you’re going to listen to two or three times to make sure you understand what’s going on. It goes deep in places, but in other parts as well we have a really good time, and I loved every minute of it and I have no doubt you will too. I will mention the Internet is a little bit scratchy in the first five to 10 minutes. It’s still fine but the Skype drops in and out slightly so there’s not much we can do, but it clears up and is fine for the rest of the show. So stick with it. Well worth it. [00:02:30] And of course if you’re enjoying our podcasts, please subscribe to us on iTunes. Leave a review and share this with family and friends or anyone you think would benefit from listening to this episode. Because once people start to get this information behind their ears … between them I should say, not behind them, and start thinking about health and nutrition differently, these podcasts become super powerful and I’m blessed to be sharing them with you guys. And enjoy as always. Anyway, let’s go over to David O’Brien. Enjoy. Hey this is Guy Lawrence. I’m joined with Stuart Cook is always. Good afternoon Stu. Good to see you. Hello Guy. Thank you. Welcome to be here. And our awesome guest today is Mr Dave O’Brien. Dave, welcome to the show buddy. David: Thank you very much. Hi guys. It’s great to be on the show, it’s amazing. Great experience, thank you. [00:03:00] Guy: It’s the official one. 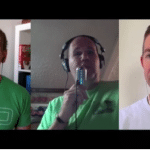 We did a bit of a rogue podcast last year for our listeners, I think after our fourth ice bath, and we got the iPhone set up and did one from the inside the Wim Hof Retreat. But it’s to get you back on and actually do an official episode and grill you for the next hour mate. Because I know what you’re going to have to say is going to benefit probably everyone listening to this show today. So cool. David: Yeah, I’m really looking forward to. [00:03:30] So Dave mate, the first question we ask everyone on the show recently, it’s been a bit of a theme, if you got stopped in the street by a stranger and they asked you what you do for a living, what would you say? [00:04:00] Probably the straightforward answer would be to say that I’m a strength and conditioning coach. But it’s actually not true. Because I’ve sort of drifted so far away from a strength conditioning coach, it’s just unreal. And then at the same time, I might say I’m looking at functional medicine, but then I’m [inaudible 00:03:58] inside those parameters as well, so really ultimately what I would say is I actually help people achieve their optimal health. The best version of what they can possibly achieve of themselves. Ultimately that’s what my job is. Yeah, perfect. Seen that first-hand, mate, and you’re doing an amazing job. [00:04:30] So let’s take it back a bit Dave, because I know … and this is a compliment by the way. You’re probably one of the most passionate people I know within the health industry. Your depth of knowledge is phenomenal. But I’m interested to know where that comes from, because you started life in the fitness industry and obviously it’s morphed into what it is now. So can you take us back, because you’ve been on a bit of a journey yourself. Can you fill us in a little bit? [00:05:00] Yeah definitely. It has been an amazing journey my story, but my story I reckon is actually shared by most people. So what I’m about to say, I reckon there’s a large majority of the population that are just going through the exact same experience, and obviously it’s all to do with adrenal burnout, adrenal fatigue, adrenal dysfunction, whatever you want to label it, but ultimately that’s the experience I went through. [inaudible 00:05:19] all the time, and this is what people are going through day-to-day. [00:07:30] I was incredibly active, obviously as a personal trainer. I’ve been a personal trainer or strength and conditioning coach for almost 18, 19 years now. And so basically I was doing a lot of weight training, at the time I was doing a lot of triathlons, marathons. All these things that people like to do, and on top of that I was training sometimes 50, 55 clients in a week. I was sleeping about five hours, and then on the weekend I would hit it pretty hard. I partied incredibly hard. I was drinking and you name it, but basically the works. And the thing is, from my perspective, this is the majority of the population. Most people are doing this. And then what really started to come to a head, is I started to get a lot of serious complications that were coming through, especially neurologically. I actually started to get a lot of things like anxiety, and I actually went from a very social person to actually having social anxiety. I used to get very anxious in social settings, which really started to make me feel quite scared, because it was the complete reverse to the person I was previously. [00:08:00] Were you putting it down to your lifestyle choices at the time while this was coming on, or you just couldn’t figure it out? Because you are working in the health and fitness industry as well at the time, right? [00:08:30] [00:09:00] Exactly, and I think the worst thing from my case is that I was heavily entrenched in wellness at this point, so the worst thing from my perspective, because I had learnt from Charles Poliquin and James LaValle, some of these people were very well respected when it comes to strength and conditioning in the functional medicine realms. I guess I knew how to manipulate my energy levels, so I started to dabble in things like licorice root to boost my cortisol in the morning, because it extends the half life of cortisol, so I would use vitamin and mineral therapy to try to manipulate where my actual cortisol levels were. And that was just giving me a false sense essentially. And yes it might have been able to drag out that period a little bit longer, but ultimately my body got to a point where I think the breaking point for me was I actually started to get symptoms that were like chronic vertigo. Dizziness, just understanding up. Even when I was training people I was just bumping into equipment. I actually had this sensation that I was going to fall over most of the time. [00:09:30] [00:10:00] And then there was these instances which as I said I’m lucky that I knew what to do in this instance, but salt cravings. And when I say salt cravings, the salt cravings were so severe that I would actually rush off to the store, the supermarket, and I would buy about three jars of anchovies, and I’d actually sit there and devour three jars of anchovies in a day. And I know a lot of people will go, “That sounds disgusting”, but that tells you where my body was. Obviously this is … And I can talk a little bit more about it, this is clear signs of what they call the pregnenolone steal, or just the hormonal cascade. [00:11:30] Yeah. And I know it’s pretty extreme, but I come across people who have experienced exactly the same symptoms, exactly the same experiences. And in that instance I did feel, okay maybe I should seek some medical advice, and I did that, and unfortunately the advice I received was really poor. Even to the extent where they wanted to perform a lumbar puncture on me, is obviously to do with they thought I had meningitis. But I knew in my head that I didn’t have meningitis. I know what the symptoms are of meningitis, and I obviously knew something was incredibly wrong, but I knew I didn’t have meningitis. [00:12:00] [00:12:30] And at that point with the advice I was given, but ultimately I made the decision to treat myself. That’s what it came down to. And that actually led me to go further down the rabbit hole. Even to the extent where looking at the bloods that they were looking at. So they obviously took my bloods, which is obviously the right thing that they should have done, but then they looked at my bloods and they said everything was right. Now if I’m falling into the wall, and I feel it’s necessary to devour about three jars of anchovies a day, and I’m bumping into things, and have got neurological problems, but then you look at the bloods and you tell me I right, what’s going to happen to an ordinary person is they are going to walk away from that experience thinking one thing mainly: I’m crazy. And I was in that situation where I knew I wasn’t crazy. I knew something was fundamentally wrong with in my body. How long ago was this Dave? [00:13:00] [00:13:30] Probably about six or seven years ago now. And as I said, my body had given me clear signs of something was wrong, but I was just like most people. I was just avoiding it. And it took something … I feel extremely lucky to have had that enlightened experience. It made me go deeper into what I’ve obviously gone deeper into. A lot of people, they avoid the signs. They go further and further down that road, and then their enlightening moment might be something they never come back from. [00:14:00] [00:14:30] It’s interesting, isn’t it? You know what, I’m really interested in hearing what you did, what you took, and how you performed to fix that, but I’m going to tell you a little story first. In a similar vein, it must have been two years ago perhaps, two and a half years ago, so Guy and myself embraced training. High-intensity training. We went [inaudible 00:14:01] and thought, this is for us. We to go hard out, we are going to crush this. We are getting so fit. And so we did, we joined an establishment and really really embraced this new form of high-intensity training. But I got it a little bit wrong in terms of timing. I was training in the PM on a Monday, going in on the AM and doing another really intensive session on a Tuesday morning. On a Wednesday evening doing the same thing, PM, straight back in on Thursday. And I got really really strong really quickly. My personal bests and gains just shot up, and I was getting strong and ripped and felt great. [00:15:00] [00:15:30] And then I noticed that my gains plateaued. And I was feeling a bit weird, and at the same time I have to add I was experimenting with a really low carb diet, because I thought I want to see what happens to my body when I pull out all the carbohydrates, and to support my new high-intensity lifestyle, based upon a lot of science and a lot of noise that was coming out at the time. And I realized that in the evening time when I was in front of the TV relaxing, everything was cool and I was feeling sleepy, great, it’s 9 o’clock at night. Come half past nine, I’m sitting in front of the TV, my heart starts to race. And I just feel like I’ve come out of the most heated argument that I’ve ever had. I’ve come out of this fully … I felt supercharged and pumped. And then I go to sleep and put my head on the pillow, and an hour later I’ve woken up and again I’m racing and pumping and so charged. And I just thought what on earth is going on? [00:16:00] [00:16:30] I carried on with the training, my gains just went down. I couldn’t lift anything any more, I was super tired. I just felt wired at the most bizarre times. And so I had an adrenal panel done. Luckily enough we had the right people to say, “Look, I just don’t feel so right.” We went to a naturopath, she said, “I just want to get your hormones checked.” Our naturopath at the time phoned me up and she said, “There is a problem with your results,” and she showed me a cortisol test that I had. And cortisol for our listeners is the stress hormone. It should be quite low, it tapers off at night, and that’s when your melatonin comes up and we should feel quite sleepy and rested. But my cortisol level was almost 11 times the limit at 10 o’clock at night that it should have been, so it should have been around three or four on this scale and I was at 55. [00:17:30] Yeah. But it was the weirdest thing, and it just goes to show, we are all very unique, we’ve got individual chemistry, we got individual biomarkers, DNA. We’re suited for certain things and we thrive in certain conditions. And I just pushed myself into an area that I wasn’t suited to. I got it completely wrong and I broke myself. So I had adrenal fatigue. My cortisol was so disregulated, and it took me about 18 months to get all that back in whack. And I’m not going to go into it, so I can kind of in some way understand where you’re coming from. So now I want to hear what you did to fix your situation when the doctors were telling you that you were fine. [00:19:30] And that is hypoglycemic, which means it’s going to elevate your blood sugar levels for you so you can turn around and have the energy to do what you got to do. So let’s not demonize it, because the reality is that most people are worse off. When you are in a bad place is when you have low levels of cortisol. And that’s adrenal exhaustion, that’s where the problems really start in terms of you starting to get digestive issues and you starting to get bacterial problems, and autoimmunity, and all those types of issues. So that’s the one thing I want to get across, that when I’m dealing with people who have got really severe issues, they’ve hit that adrenal exhaustion. Which actually means that they’ve got low cortisol. It comes out in their blood markers and it would be reflected in things like cholesterol levels, because cholesterol is a pre-cursor for every steroidal hormone in your body, and that steroidal hormone is cortisol. And then we see that in blood markers, and what’s our common thing to say? Oh, you’ve got low cholesterol, that’s good. Stu: Yes of course. [00:20:00] [00:20:30] [00:21:00] Yeah, but the reality of the matter is, cholesterol is not the enemy. When you’ve got low levels of cholesterol, it’s a good indication that you’ve got low levels of cortisol. 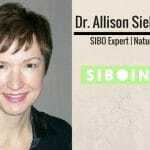 That you’ve actually got low levels of testosterone and androgen hormones and these anti-aging hormones. So that’s when you’re really in a bad place, and obviously what happened to me is I went through this acute phase for a long period of time, that’s that pregnenolone steal, where initially we’re just producing too much cortisol, so the body’s going to bypass all these other hormones, like DHEA and testosterone and aldosterone. Because the priority hormone is to always go to cortisol. More and more cortisol. And the reality is, just like with Stu’s case, when you’re producing a lot of cortisol, you feel amazing. You feel unbeatable, you know what I mean? You got so much energy, and in that instance, most of the time, you can survive on very little sleep. You can survive on four hours sleep, five hours sleep. You might be a little bit wired at night, but you’re generally extremely productive. Does that make sense? So a lot of people are sitting in that realms, and they just go, “This is amazing, I just want to keep on feeling like this forever, so I’m just going to keep on doing what I’m doing.” You know what I mean? Stu: [00:21:30] Yes, that’s a really good point, because I speak to many people who say I’m at my most productive 11 o’clock at night, I get my second wind and I can power through the night and get all this work done. And while it might be great for their boss, I don’t think it’s very great for them in the long run. [00:22:00] Definitely. Even when you produce things like growth hormone, and obviously growth hormone is another anti-aging hormone. Again, it helps with building muscle, that sort of stuff. Well when you actually produce the highest amounts of growth hormone is between 11 and 12, when most people aren’t actually even in bed. And that’s not even taking into account when the sun goes down, so lights off, melatonin on. And melatonin is a powerful antioxidant, and that’s what we call a kamikaze antioxidant, which means it actually kills off pathogens and then kills itself. But we’ve got to replenish it as well. Everything happens downstream. Once this one trigger, with so many things getting triggered off. [00:24:00] [00:24:30] So I just quickly wanted to say then, do you think with that pathway you’ve just explained, do you think it would pay for us to be little bit more mindful of our environment? The reason I say that is because at night time when we’re plugged into our smart phones and we’ve got tons of blue light, we’ve got all this stimulation happening as well, and maybe at meal times when we are checking our … I see so many people now eating with one hand and texting with the other. So they’re not mindful of the fact that this is time to eat, so switch on my digestion, stuff like that. Or it’s time to sleep now so let’s get into our sleepy routine. We are inhibiting lots of processes that could be very beneficial to us in terms of digesting properly, preparing for a restful night’s sleep as well, so I just wonder, because we are really distracted 24/7, that that could be a factor in all of this. [00:25:00] [00:25:30] Yeah, it’s definitely a really valid point. I’m lucky enough that I deal with blood markers and I deal with stool testing, and where you’re talking about say where people aren’t sitting down, they’re not having a meal with their family, and most of the time what are people doing when they eat, they’re eating on the run. And guess what, when we look at stool tests, people have a lot of food particles in their stools. And I can get really technical and talk about what other chemical reactions might be taking place in this, but you know what, sometimes it’s just simple case of people not chewing their food. It’s actually people eating on the run. It actually leads them to have a lot of food remnants and vegetable fibers and so forth in their stool. When you sit down and eat, you’ve got to sit down and eat. And I’m guilty of it sometimes as well, but it definitely does carry on to sometimes what’s going on with my digestion. So definitely. That’s a sign a really good health, but actually I was actually standing on the edge of a cliff. And that’s when the real issues start to happen, right? And as that’s where most people are at when you see them? [00:28:30] Yeah. Most people are sitting in that compensatory or that middle section of adrenal fatigue. So they’re standing on the edge of the cliff, literally. And when you get pushed off the cliff, the reality of the matter is, what can you get? You can get autoimmune disease, you can get cancer, and that’s where unfortunately some of the really bad things happen. Stu: Where would you start addressing this? [00:29:00] For me, what actually happens, initially it all comes down to the brain for me. That’s where the stress response starts. But I wish it was that easy sometimes. Because actually what happens, that process happens and then what happens, people have got a digestive issue now. So they’ve got something like intestinal permeability. Now I’m sure that you had many guys on the podcast that talk about intestinal permeability, where you’ve got the gaps in the tight junctions, and more pathogens and toxins and so forth getting into your bloodstream and causing antibody response, and causing- Stu: Food allergies galore, food sensitivities. It’s like a violent loop isn’t it? Once one starts, they just keep feeding into each other. It does. Guy: And how popular do you think Candida is in society? [00:31:00] [00:31:30] When I first started learning about this stuff, I used to think candida was … Everyone’s got candida, and the reality when you actually start doing stool testing and looking at … Some people have candida, but a lot of people have intestinal permeability, and a lot of people have negative gram bacteria is the big problem that I see quite regularly. And negative gram bacteria, just to clarify for the listeners, we’ve got two major forms of bacteria. One’s positive gram, which means it just has one cell membrane, and that’s a lot of your good stuff. That’s like the bifidobacterium, the lactobacillus, if you’ve heard the adverts, like inner health plus and all that sort of stuff. So this is a lot of your good stuff is the positive gram. There are some pathogenic forms that are positive gram, but then you’ve got the negative gram, which means that it has two cell membranes, and that outer cell membrane is made of a thing called lipopolysaccharides, and essentially when you’re expelling a lot of that, when that gets broken down, that gets expelled into the bloodstream and so forth. That’s endotoxin, which actually causes further damage to the small intestine, and ultimately it can start to cause neuro inflammation and so forth. [00:32:00] [00:32:30] So the negative gram bacteria, which would be pathogenic forms of E. coli, it’s things like citrobacter, klebsiella, some of these types of negative gram bacteria, we’re seeing it all the time, that people have these forms. The problem is, a lot of these forms of negative gram are antibiotic resistant, which means … Let’s use a little bit of logic here. Which one is going to be easier to break down ultimately? The positive gram bacteria, which mainly is your good stuff. Which means when we go in with antibiotics and so forth, we’re mainly getting rid of the good stuff, and what we’re left with is most of the time a lot of this negative gram bacteria, which ultimately, some of these negative gram bacteria, citrobacter, that can lead to things like MS. A lot of them are related to autoimmune conditions and so forth. 100%. [00:34:30] [00:35:00] Look, I’m really passionate about health and fitness, really passionate. My concern for where things are at, especially in the fitness industry, is the message that is ultimately getting sent to people. So the message that is being sent is if you want the ultimate … It’s all about body composition results, and we’re going to get them in the shortest period of time, which is 8 to 12 weeks. I’ve got an issue with that, because if I want to correct someone’s thyroid, that’s probably a little bit more robust than some of the other areas to fix. If I start increasing someone’s calories, stimulate their metabolism, maybe you’re looking at about 28 days to reset the thyroid to a certain extent. But if I look at the adrenals, what we’ve just spoken about, the bare minimum is going to be about 12 months, up to 24 months. And then for me to ultimately correct the gut and get the gut back to where it should be, we are looking at two and a half years to three years, but then let’s go ahead and get someone to do an eight week, 12 week transformation. That’s ultimately going to lead to even further complications with the adrenals and their digestive health and so forth. And leading them in most instances to a path of further under-eating. [00:35:30] [00:36:00] [00:36:30] So ultimately what they’re going to do, because the majority of the people that we see are consuming about 1200, 1300 calories for a female, 1800 calories for a male, and the reality is everyone’s different. And what’s essentially going to dictate how much fuel you need, well yes there’s the whole thing of energy in and energy out, but ultimately what organ utilizes the most amount of fuel in the body? It’s the brain. And if you’re using your brain a lot, guess what? You need a lot more things like amino acids and so forth to actually fuel the brain. You got a lot of stress in your life, well guess what? You churn through magnesium more. Tenfold in some instances. That’s just research based on training. You churn through your glutamine, which is another amino acid, and glutamine, what does that actually do? It feeds the epithelial cells in your small intestine, which you need for producing secretory IgA, which is immuno globulin. And then cholesterol. Cholesterol is rapidly decreased when we are under a lot of stress. And so it’s the message that’s getting sent in the fitness industry that I really don’t like, because a lot of the people have got serious issues. And to correct a lot of the issues and get these people back to a baseline, in most instances you’re looking at year, two years, good habits. Just thinking mate, and thoughts just popped into my head. It sounds like you’re the perfect person to run a 156 week full body transformation program. David: I like where you’re coming from Stu. Let’s do it. Brilliant. I would sign up. You can be in charge of marketing with that one. I will do. I will do. [00:37:30] [00:38:00] It’s a tough one, eh? I remember having a conversation with you Dave, and I never thought of it this way before, especially with fitness trainers and personal trainers in the industry that are coming in, but when you look at all the health practitioners, from naturopaths to nutritionists, doctors or whatever it may be, the fitness trainer is the one who is spending the most time with his client, because they generally see them two, three, four times a week. I used to find, working as a fitness trainer almost 10 years ago, they would come in but they had bigger hopes and expectations as opposed to just learning some exercises. It was always about trying to solve some issues, some injuries, some weight loss problems, their nutrition. And all of a sudden they expected you to have all the answers. But at the same time, the education is not there. It’s like how far you do it. So can you show your thoughts on that and what you’re doing with your guys, and how it’s evolving? [00:38:30] [00:39:00] Yeah definitely. As you said, the perception, especially with personal trainers, and it is the image that is set out there in the mainstream field. You see it on The Biggest Loser and all these types of things, is that a personal trainer is ultimately just a motivator. And while I’m not discrediting that as being an important element, it’s actually so small down on where I think the key essential ingredients for a great personal trainer are. For me, if a personal trainer is seeing someone three, four times a week, are they going to have a more significant change on that individual’s lifestyle? 100%. [00:39:30] [00:40:00] I compare to a doctor who ultimately might be seeing someone once every two years, maybe once a year, and a lot of people say personal trainers shouldn’t be dabbling into things like blood markers and stool testing. I disagree totally. Why do I disagree with that? Because that’s exactly what personal trainers should be doing, because they’re seeing that person all the time. They can control those elements. It’s unfortunate that we just set the bar very low for what is expected of a personal trainer. And so with my guys I teach them about blood chemistry. I teach them about bacteria. I teach them about things, going into depth with cold therapy and heat therapy. We literally learn about every … Neurotransmitters, amino acids. We’re going into deep realms of these things, and a lot of people go, “Why are you doing that?” I say because we deal with people all the time. And if we’re not doing that, this is a disservice to the client. Stu: Well that’s right, and I think it would be very tricky to know where to start with the new client if you don’t know where their benchmark is to start off with. [00:40:30] Yeah, 100%. And that’s thing, people are coming in, they’re seeing a trainer, and the trainer’s going, “Let’s go we going to put you through this eight week, we’re going to smash it hard.” And then that person’s got what I was talking about before, intestinal permeability. Well, the reality of the matter is, you might as well take in that person’s head and then just bang it against a brick wall for eight weeks. Stu: Yeah, that’s right. Because you’re actually sending that person further down the route of disease and illness, ultimately. Stu: Well exactly. Compounding, exacerbating whatever their condition might be. [00:41:00] Guy: I was going to say it’s a tough one, because people are going to wander in, wanting a result. So what I’m interested in is your process, Dave. Because they might not even be aware that blood markers and stools and stress and all these underlying issues, they could be blissfully unaware going, “I’m going to come in and just train at Dave’s Fifth Element because I want to lose 10 kilos.” [00:41:30] Stu: That’s right. Get on the treadmill, watch Days Of Their Lives on the screen, come out thinking, “Brilliant.” Guy: Yeah, talk me through the process a little and what you do. Okay, so someone will come in to see us. When they actually join up, we’re pretty transparent about how our processes work. We go through an assessment process. That’s actually a two-hour assessment that we go through. So we actually look at their whole orthopedic profile, we look at their biomechanics. But the reality of the matter is, the reason that most people don’t move very well, is very little to do with their biomechanics most of the time. Most of the time it’s just their extremely poor lifestyle, to why they’ve got joint pain and what they’ve got these types of issues and so forth. So we go through all that processes, and then we obviously look at things like their nutrition, look at what’s been happening with their health, look at previous medical conditions and so forth. And then we get them started in obviously training. And for us, a really really big focus is actually looking at the spine, and obviously that’s stuff that I’ve talked to you heavily about Guy, and I’ve done some of that spinal articulation with you as well. [00:43:00] [00:43:30] [00:44:00] So we really want to help with health in the spine, so if you actually look at the spine, what the spine wants to do, it’s got facet joints and it wants to articulate. It wants to move. But in modern realms, what have we taught people? To keep a neutral spine. Walk around, neutral spine. Even when we are doing strength training, it’s neutral spine. And I’m not saying that’s wrong, because essentially all you’re trying to do is shift a heavy weight to actually help with a particular process, but if we’re just talking about the health of the spine, the spine wants to move in all these different planes. When we do a lot of bar work and so forth, we’re only working in this sagittal plane. We’re not working in this transverse plane and so forth, and what a lot of people don’t realize, once we start to get a lot more movement through the spine, the spine actually helps you produce a lot of red blood cells. It actually produces a lot of white blood cells. It produces things like glycine, and glycine actually helps shut the brain down and relax the brain. So that’s why we’re so big on movement training and so forth. So we want to get people moving. It’s all according to the individual. [00:44:30] And then what we go into is looking at blood markers, and those blood markers enable us to depict what’s actually going on with that particular individual. And we like to read between the lines with those blood markers. We don’t look at than the same way as modern medicine would, and in that instance I’ll just give you one example. One example would be hemoglobin. Hemoglobin, from medical terminology, they would just go that relates to oxygen getting transported through the body, or proteins to the red blood cells, or iron. Correct? But the way we like to look at it is go further down the chain. [00:45:00] And hemoglobin comes from somewhere else. Hemoglobin comes from hem-, and then hem- comes from glycine. And guess what glycine is? That’s an amino acid. So actually a lot of your blood markers are a depiction of the amino acids you’re either getting or you’re not getting. And it’s a thing, because we are highly stressed we’re taxing a lot of these amino acids, the whole thing with glycine … If you read a textbook, the textbook would say glycine is a non-essential amino acid, which means we produce it, don’t worry about it. [00:46:30] There’s so many variables, it’s insane. Listening to you now, it’s just making my head spin off. It’s incredible. So you talk about how crucial movement is, and like I said, and I’ve come and done some sessions on it, and it’s fantastic, and I can even feel it mentally afterwards. You’re just alive, right? For people who are listening to this, where do you see the importance of that kind of movement on a daily basis and then also strength training? Because I have no doubt that the listeners coming to this that might not even have lifted a barbell before. Look at strength training. How crucial a part of the holistic prescription do you see that? [00:47:00] [00:47:30] We like to look at it like a systematic approach. Most people come in, ultimately, what are they then doing? Not much. They’ve been sitting down and so forth, so their initial problems lie in they’ve got a week posterior chain, which obviously refers to the backside of the body, which obviously helps us to keep nice and upright. So the way to look at strength is like the seed, and everything else grows from that. So initially we are probably going to do some bar work. We want to increase a little bit of lean muscle, because lean muscle does obviously enable people to burn more fat at rest, and it also carries on to longevity, helps protect you against things like disease and all that sort of stuff as well. So it’s sort of a fundamental base that we like to correct. [00:48:00] [00:48:30] But then once you’ve done that, you got to move into the realms of how the body likes to move. And ultimately, in strength, are you just walking around picking up things with a straight back all the time? No. So if you’ve never picked up something with flexion in the spine, and then you go pick up a couch, and you never strengthen the spine in that parameter, then ultimately was going to happen, you’re going to do an injury. So that’s where things like strongman training really come into the fore. Because in strongman training, you might be lifting a stone and your spine is in flexion, then when you bring it up, the spine goes into hyperextension at the top, and what’s happening with the spine? Articulation. What’s going to be a byproduct of that? More red blood cells. More white blood cells. So we just got caught in sticking in one dimension. We just go, “That’s it, I’m just going to stay here.” But you’ve got to move to the next thing. And then you move to strongman training, then when I was talking about the movement training, you look at our joints. Look at the shoulder joint, the shoulder joints are great example. The shoulder joint only sits 25 percent in the socket. Guess what? It wants to move. That’s what it wants to do. But when we do training, we go to the gym, what do we do? We push a [inaudible 00:49:01] up ahead, it’s all this open kinetic chain stuff, where it wants complexity. You look at the fibers in our chest, they cross fiber all over the place. That’s just built for complexity. We are built for complexity, and we’re not doing that. And the good thing is, when you actually do more complex movements, guess what works harder? Your brain. Which actually means you’re doing what? Expending more calories as well. And then it’s good for the brain. The brain has to problem solve. [00:49:30] Guy: Oh mate, when I was doing those movements with you, I tell you, problem solve is an underestimate. [00:50:00] So what about … Let’s bring this back to Joe public. And I use that term lightly, because I put myself in that category too. So I am in the category of Joe public. I can’t get to a gym, I can’t fly and see you guys. I’m confused about how I should move. I’ve got a pair of trainers, I can go outside and just run for hours on end. If I wanted to be, and like we started off, the best version of myself, or at least build up to become the best version of myself, and I had 30 minutes a day to do something, what could I do? [00:50:30] What I would strongly advise, as I said because so much comes down to the spine when it comes to movement, is articulation of the spine. So everyone has to equate that we have to smash ourselves. Correct? That’s what you got to do. See, you’re really struggling with that, Stu, yeah? Yeah, like what on earth? [00:51:00] He’s moving his head side to side right now for the listeners. Stu basically can’t do it. It’s really hard. Every time I see a mirror, Dave, I’m doing this now. [00:51:30] Yeah, and looking at … We get blockages in the spine, and if we can’t actually move in these different planes, like in our cervical spine, in our thoracic spine, our lumbar spine, you get a blockage there, and if you get a blockage there, what’s going to happen? All that stress and so forth is going to go into another area in the body, essentially causing injury because we can’t get this flow up the body. So what [crosstalk 00:51:36] be a good place to start for someone, if they go I just want to get my spine … If they’re doing nothing? Guy’s only saying this because he’s a real yogi. He wears these leopard print yoga pants as well, you should see them. So this is a loaded question. You got to remember, Stu, I’ve seen him move as well. [00:52:30] So yes, it’s a good place to start. But I don’t want people to have this perception. I love yoga, so don’t get this wrong, not having a go at yoga, I love it, but where I think yoga really comes into its own is for the brain. Because people … You remember I spoke about in the last podcast and talked about GABA? GABA is like you got 122 neurotransmitters, you’ve got one and a half that actually help to shut your brain down, and that’s GABA. So yoga is an amazing way to naturally encourage your body to produce more GABA. So really that’s where I think yoga really comes into its own. [00:53:30] It becomes difficult, I 100% agree, but I like to take people out of their comfort zones. Because we’ve been sitting in the bubble for too long, and you know what, with Stuart, we’re going to do a lot of these spinal articulation, and he’s going to find it really really hard. But the more and more he does it, guess what? He’s going to get more confident with it, and what’s he going to notice? All this movement that he notices day-to-day. And he might even notice improvements in things like his immune system. And little carry on effects like that. So I really encourage people to get a little bit more complex. Yes, definitely yoga is a good place to start. You need a little online video series, Dave, so we can just go mate, check these out with your moving, you know? [00:54:00] Well I encourage people to look at one of my mentors, Ido Portal. For me, he’s really the founder of movement. And you can look up stuff with Ido, I 100% encourage people to do that. And he goes into a lot of this stuff, but even Fifth Element, we are looking at bringing out videos to show people to do this articulation stuff as well. [00:54:30] [00:55:00] I think that would be a great idea. Another thing that I do as well in the evening is, I like to watch a bit of TV, so I like to wind down. And I do it for a particular reason. Not because I’m lazy, but I like to switch off my thinking brain. So I like to watch trash TV. Whatever. Netflix series, but at night, it stops me thinking about all this nonsense that I think about all day. And a lot of it’s nonsense. It’s work, family, stress, ideas. But when I watch TV, I do this for about an hour every evening, I dial in. But I don’t sit on the couch. I sit on the floor, and when I sit on the floor, I just go through a whole series of stretches that I do. And so I sit there with my legs open and I’ll get down and do all these crazy … It’s all stuff that I learnt in cross fit essentially, these really nice stretches, the hips and stuff like that. Do you think that would be beneficial, or am I just wasting my time? [00:55:30] [00:56:00] Me personally, I don’t think any movement is a waste of time. One thing is clear, that people have to move more. That’s for sure. Now if that means I’m just encouraging people to walk more often, yeah, do that. Maybe get into the nature a little bit more and do that. Because then you’re going to have more biochemical benefits to doing that. It’s interesting, you talk about cross fit, and one of the things I really admire about cross fit the most is it’s just people training together. So let’s move, like when me and Guy did it with Sam and the three of us were doing it, we are doing a community, we’re moving together. And maybe Guy’s movement patterns weren’t amazing, but that community elements also adds an extra biochemical benefit to the body. [00:57:00] I think the underlying message of what he’s talking about with the blue zone areas, that’s powerful. And where I want people to understand how powerful that message is, is because we can take all these elements and obviously I use things like Wim Hof, like cold therapy and breathing, and then I talked about movement, then I talked about training, but ultimately, and if we want to talk about fasting, they’ll have these powerful chemical reactions on the body, and I don’t dispute that. But where I might actually say is, are they as powerful than if you do them in a community group? And 100% not. [00:57:30] [00:58:00] When I do the breathing by myself, it’s nowhere near as powerful as when I’ve done it with the Wim Hof Retreat. Or when I’ve done it at Fifth Element with 30 other people. When I train, is it as powerful when I do by myself, as if I do with five other people, or when I did the movement training with Guy, is it as powerful as when I do by myself? And it’s definitely not. The one thing we know with community, there’s this thing called BDNF, which is brain-derived neurotrophic factor. Basically, that enables us to produce new brain cells, and actually repair the synapses between the neurons to actually help with neurotransmitters and so forth, so mood and all that sort of stuff. And you know which factor actually has the biggest chemical reaction when it comes to that is community. You have inspired me to join my community library. That’s what I’m doing. Brilliant. It’s so powerful, there’s no doubt about it. Especially if you’re doing that, you got a smile on your face, you are inspired by others doing it. It definitely 10Xs the experience, without doubt. [00:59:30] But if you want to have a more powerful experience on your body, as I said all these things that you guys talk to all these experts about all the time, but do it as a community. Do it together. And that reaction that it’s going to have on the body is so powerful. Without me going into every single chemical reaction, but it’s so powerful. Guy’s aware of the time. I you just looking at your clock there? So we’ve got a few wrap-up questions. And one of them, I’m going to jump in and ask about your non-negotiables. So have you got these little tips, tricks, techniques that you do every day perhaps to be the best version of yourself? So what does the man Dave O’Brien do for yourself only? [01:01:30] But just the power when it comes to your red blood cells is second to none, especially those neutrophils, those heavy hitters, against your bad bacteria is unbelievable. And I guess the other thing is movement. I probably shied away from smashing myself all the time. I love to do that every now and then, but I guess what I really encourage my body to do now is more explore movement. So I do a lot of those primal movements. I love to do a lot of locomotion stuff, a lot of the stuff I taught to Guy. How you feel afterwards is just amazing. It’s just because of that complexity you’re getting with the spine. So breathe, cold therapy, movement. I think that’s a formula for feeling pretty amazing. That’s [inaudible 01:02:01] for me. No sugar, gluten, it’s a no-brainer. Of course. We will run out of time talking about gluten, but will keep that for another one. Unless you like it. Unless you like it. And then embrace gluten. Another podcast that one, for sure. I love it, I love it. And last question mate, what’s the best piece of advice you’ve ever been given? [01:03:00] [01:03:30] I don’t know if it came directly from one person, but I guess I’ve been lucky enough to learn from a lot of amazing people in many different fields, and the one thing by listening to them and getting all the information, the one thing I know is there’s no such thing as a monotherapy. People seeking a monotherapy, and unfortunately I feel you’re going to be disheartened, if you’re just seeking this one thing that’s going to change it for you. You know what it entails, being around all these people and learning of these amazing things? It entails you adopting all these approaches. Gregg Bradden talks about tapping into the heart, you got to tap into the heart. You’ve got to look after your gut health. You’re going to have to fix intestinal permeability, you’re going to have to do this. You’re going to have to do a bit of cold therapy. You need to do breathing. You need to do mindfulness. [01:04:00] And a lot of people go, “That seems like a lot of work,” but one thing I guarantee you, if you do a little bit of all these things, that’s how you actually achieve optimal health. That’s how you’re going to choose the best version of yourself. So don’t think monotherapies, there’s no such thing. Vegan is not the answer, vegetarian’s not the answer, just like paleo is not the answer to the rest of your life. They serve a purpose for a period of time that’s going to help realign some of your biochemistry, but is not the sole answer, just like there is no training method for the rest of your life. So that’s the one thing that’s really resonated with me, with being around such amazing people. Stu: Brilliant. I like it. I can see that there is some truth in what you are saying. Very good. So what does the future hold for Fifth Element mate? Fifth Element Wellness. And yourself. [01:05:00] [01:05:30] [01:06:00] The main thing for Fifth Element is we really want to help people. Ultimately that’s what I’m driven by. That’s what Fifth Element is driven by. And how we believe we can help people is empowering them through education. Ultimately we believe people are getting told to do this, do this, but then they don’t actually get the information on why they need to do it. That’s not empowering for people. You name one person that feels empowered when they have to take something and actually don’t now how it’s helping them. Inevitably down the line, they’re just going to stop doing it, because they don’t understand why they’re doing it in the first place. So Fifth Element, what we really want to do is we want to help to empower people by educating them, understanding all these different facets, and of course we want to reach out to people not just across Melbourne and Victoria, but across Australia and ultimately even across the globe. So that’s really where we want to take Fifth Element, is just to help people and spread the message. Ultimately spread the message of what all these other people are spreading as well, do you know what I mean? It’s fantastic mate. Obviously I’ve been multiple times now down there in the community and it’s just been phenomenal what you’re doing. It certainly opened my eyes to what is possible within one central hub. It’s quite incredible mate, so well done. [01:06:30] Yeah, I think your people can experience that community vibe of what we’ve got at Fifth Element. We just want, not them to essentially have a Fifth Element community, but to have communities. Preaching the same thing because it actually has all these positive effects on the body, and if we can do that, we can encourage more people to do that, I think it’s just going to be amazing. [01:07:00] Yeah, it’s brilliant mate. And for our listeners, the question is how can we get more of Dave O’Brien, but I know you’re not exactly very active on social media I’m guessing. David: I’ve got a bit of a social media phobia actually. Guy: I’m working on you mate. We’ll get you an Instagram account up and running soon, don’t worry about that. So in the meantime, where shall we send them? People want to know more about you and Fifth Element and everything else that you do, where’s the best place to send them mate? It’s to go to our website. Fifth element, 5ew.com.au. We’ve got a landing page there where people can tap into some of the stuff that I’ve talked about today. And ultimately if they’re interested in things like body chemistry analysis and going down those lines, online you can find that, and then ultimately we can help people with some of their more complex questions that they’ve got and so forth. [01:08:30] Yeah, correct. Level 1 seminar is basically talking about a lot of the things that I’ve talked about today, in terms of giving cold therapy and heat therapy, and the movement training and strongman training, and then tapping into gut health, and cortisol. We’re looking at from a different aspect to obviously to what the mainstream fitness industry are looking at, and we are running these level 1 seminars, like body chemistry analysis seminars. So we’re really going quite heavy into the education space, because we feel if we can train other people and educate them on the things that make a difference, then that going to filter through to the rest of my personal trainers and health experts and so forth. Absolutely. Brilliant mate. Well hopefully after today’s episode when it goes live, you can inspire a lot more people to come and check out your work and what you do, and all I can say is get amongst it because it’s freaking awesome. So Dave thank you so much for coming on the show buddy. [01:09:00] Yeah thanks very much for having me on the show. It’s been great. I know I babble on a little bit, but it’s been amazing, and I respect what you guys do, it’s amazing. Because ultimately you’re sending the same message as me. So it’s great. Thank you mate. Great to talk to you. Guy: Thanks guys. You too, Stu. All right, take care guys. Great interview! Dave talks about a study saying that movements of the spine effects red blood cell production. Just wandering where I can find this study? I would contact 5th Element Wellness directly Nick.